Have you noticed that neutral color palates are in style today? Whites, grays, and creams are still the canvas of choice. Trust me when I tell you that this is a tremendous blessing for those who enjoy design and redesign. 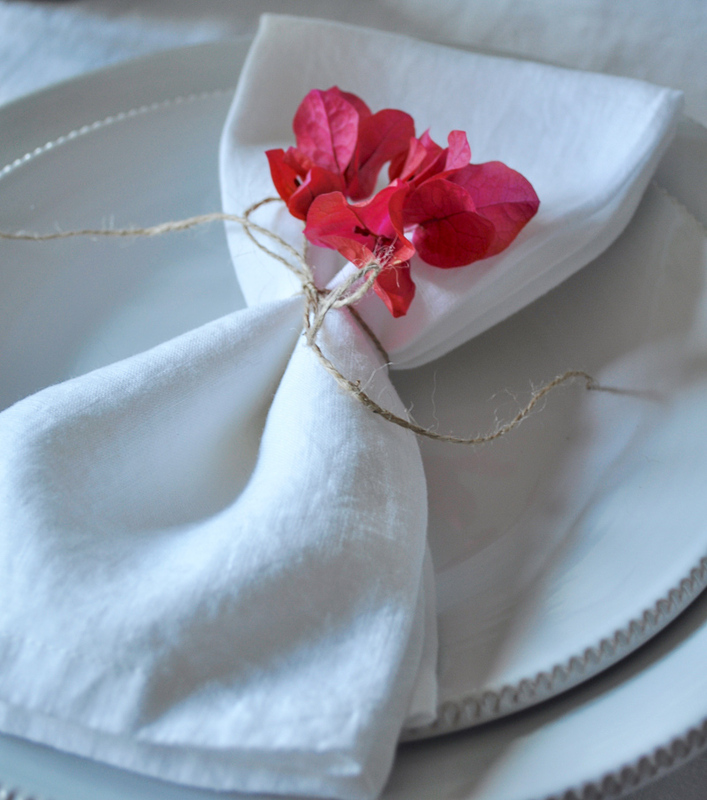 Today, I want to show you a few easy ways to style your dishes with spring flowers that will greatly elevate the design and look of your dining table. 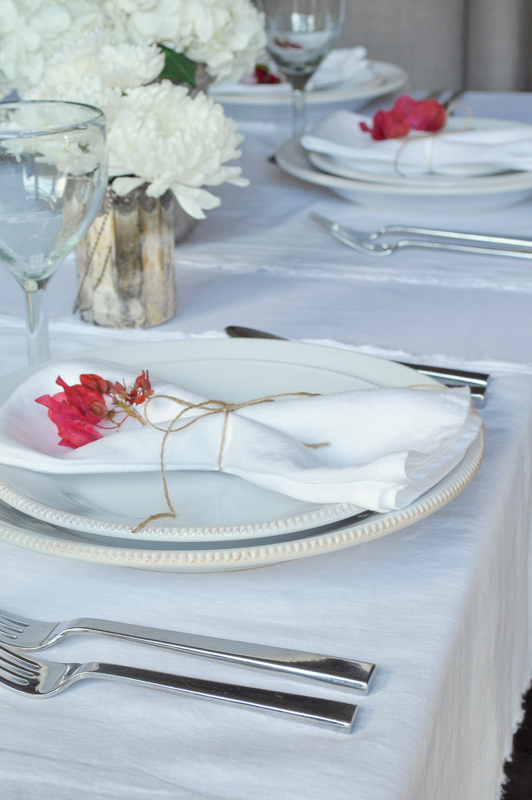 The best restaurants usually serve dinner on white plates. Now, why is that? 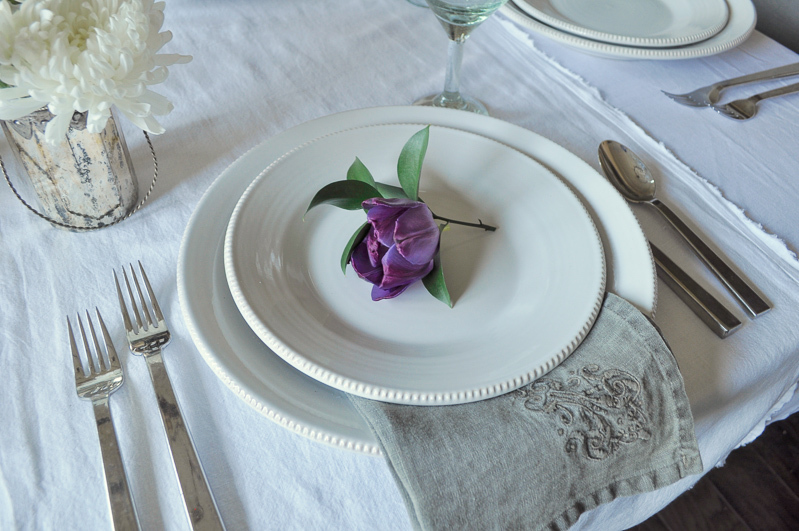 You will find that my place settings are always of a neutral color, placed on top of a runner or table cloth of a very similar color. A beautifully and colorfully prepared dinner will appear even more appetizing as the contrast between the plate and the food stimulates the senses. My husband even appreciates our neutral palate as he is usually the one preparing our five star meals and he loves for his hard work to be noticed! That same theory holds true prior to the food arriving. 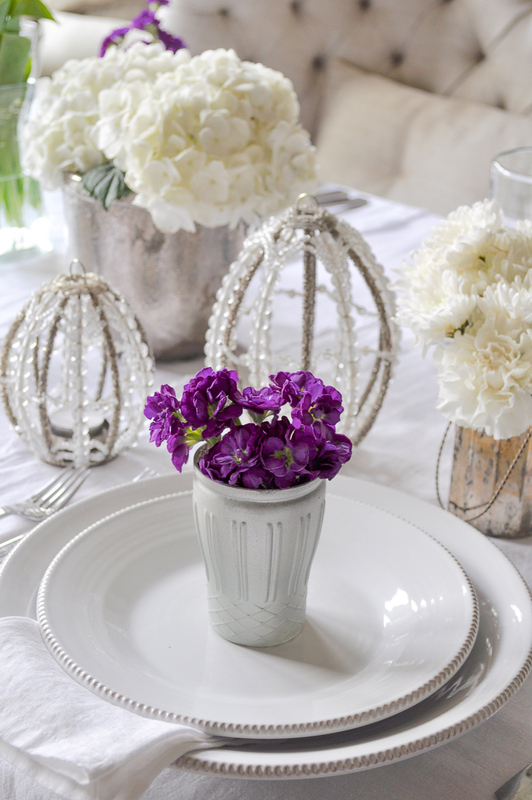 As you may know, I adore floral arrangements. 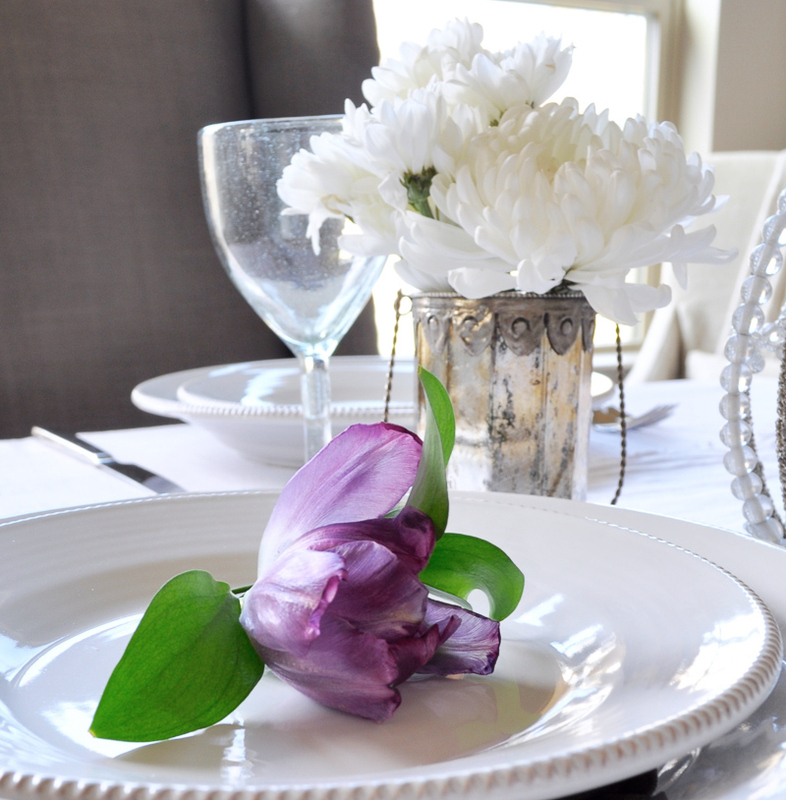 We are all generally familiar with the gorgeous and meticulously prepared centerpieces which adorn dining room tables. However, I am not independently wealthy nor am I a florist. But, I want my guests to feel special when they arrive for the evening. 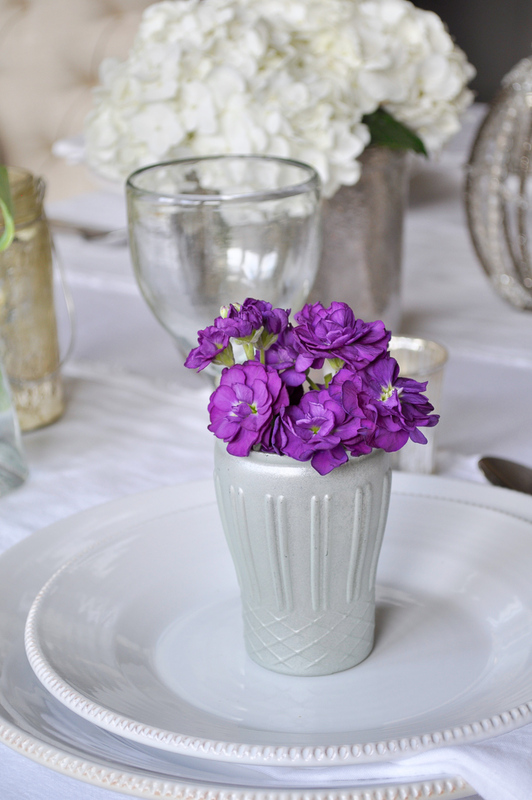 One of the simplest components of setting your dining table is the variety of color you can add by selecting a few vibrant flowers for your place settings. Remember that less is more. 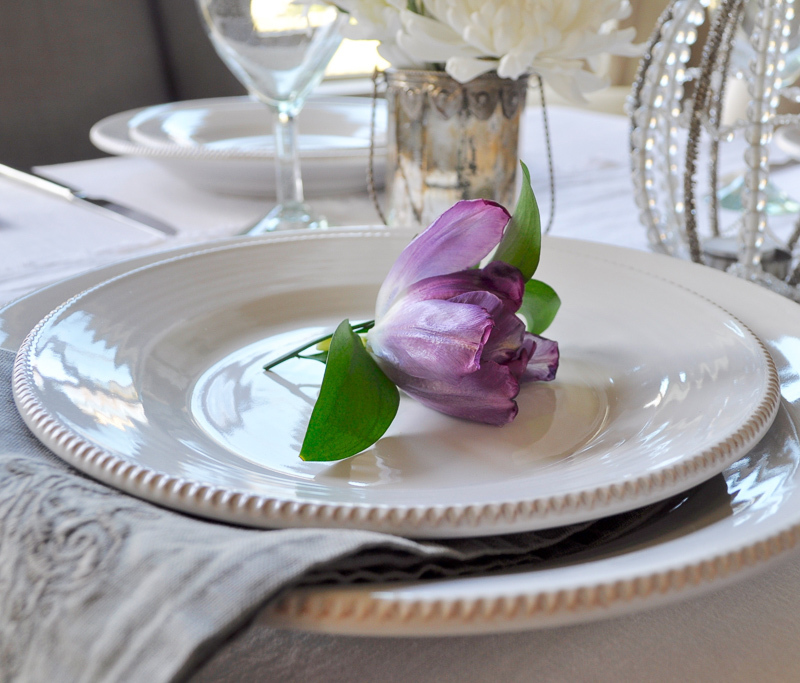 One simple flower or a very small bouquet per place setting will add the perfect bit of contrasting intrigue. Try a number of combinations. The flowers do not have to match one another either. Your home will be somewhat reflective of your personality. 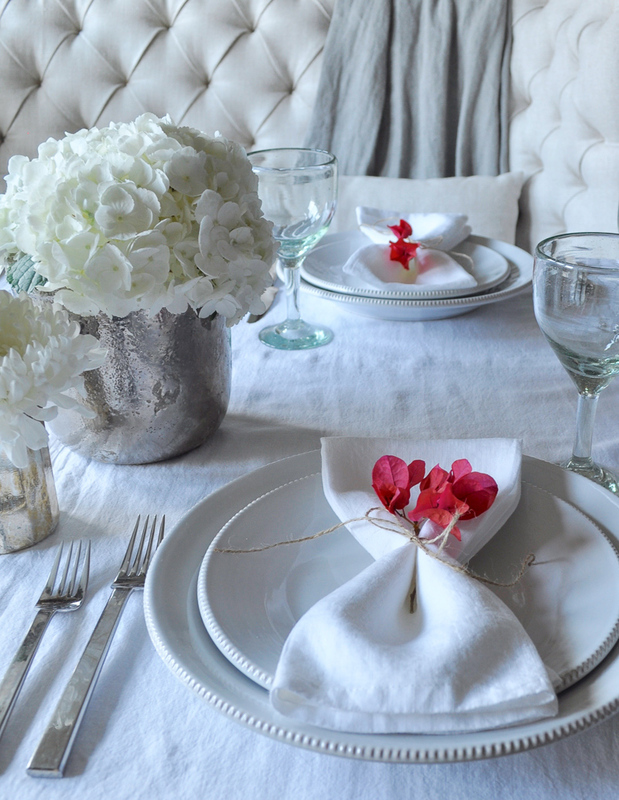 Embrace it as you prepare and style your dinner table. Nature has truly blessed us with the greatest accents we can utilize. Below, I have a few examples which will hopefully inspire you for future gatherings. I hope you enjoy! 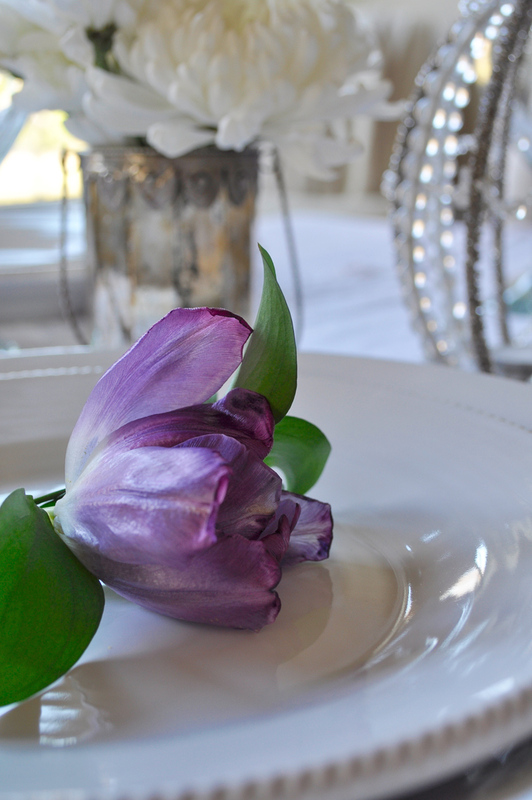 Tulips make a dramatic statement. 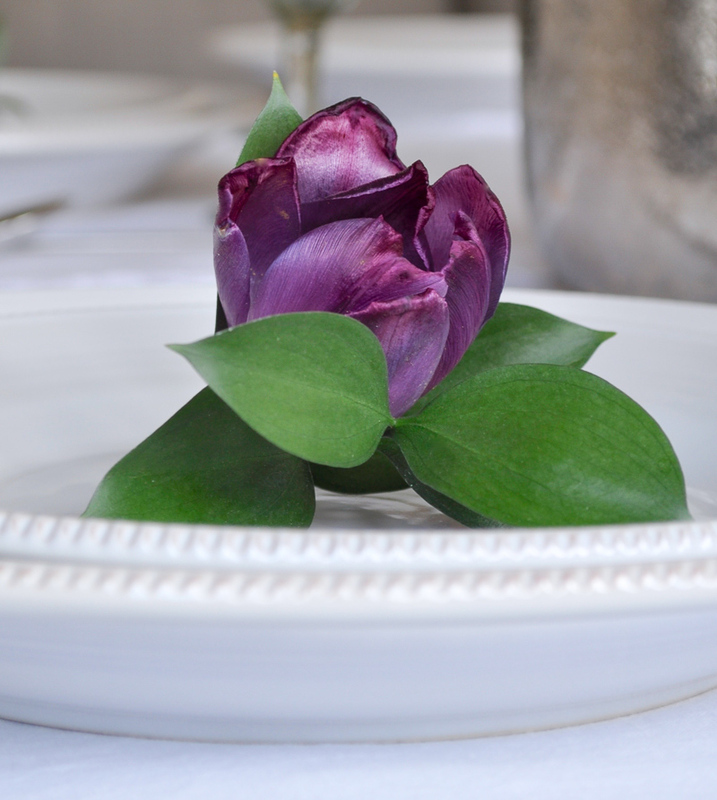 Notice how the addition of just one fresh flower to your place setting can give your table the look a professionally decorated event table. 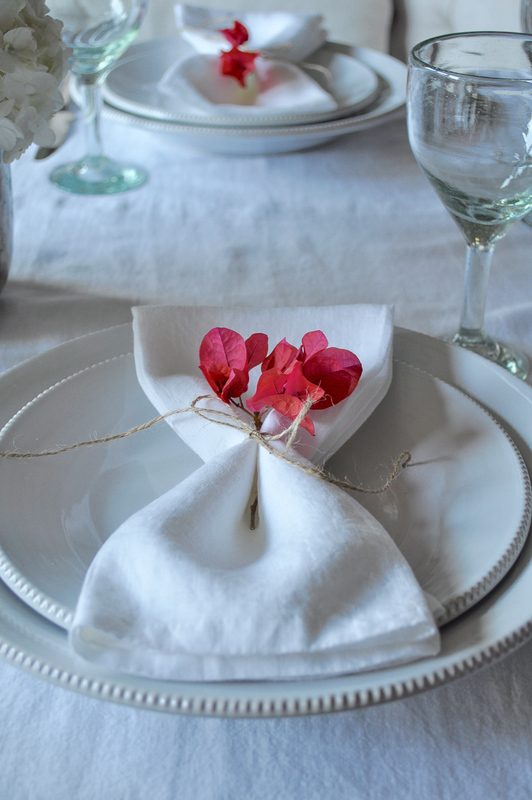 Another flower, bougainvillea, can be clipped from the garden and simply tucked into a napkin. 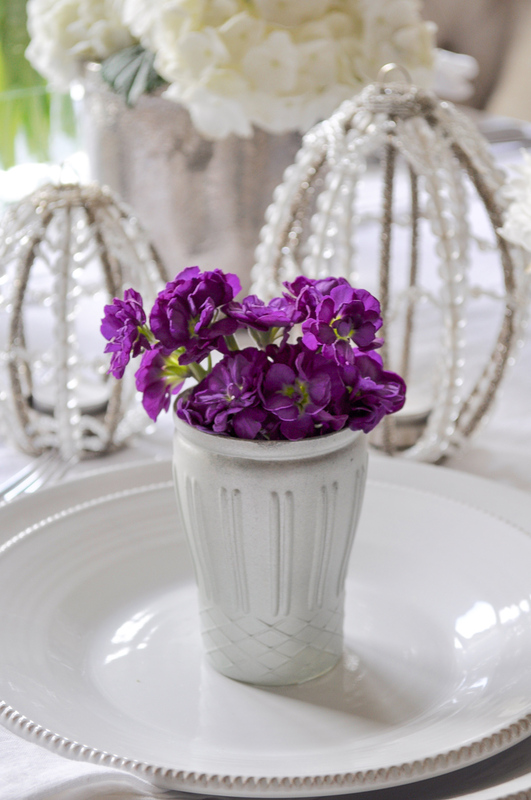 As a third option, an individual bouquet can be placed in a small votive and also serve as a lovely gift for your guests. 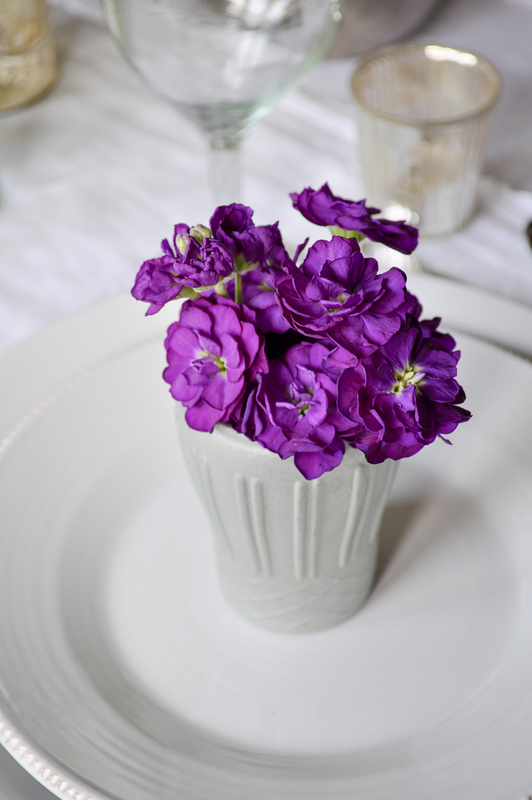 Beautiful and fragrant stock provides a perfect pop of color. Pottery Barn dishes can be purchased here. So beautiful and what an impact one bloom can make! Thank you so much Kelley!!! I totally agree and I know you have a similar love for flowers as I do, so your sweet comment means a lot to me! Thank you so much Tana!!! I hope you know that your opinion means the world to me!!! Stunning Jen! So many good ideas! Thanks so much dear friend! I’m so happy to help. Hugs to you Jennifer and congratulations again on your beautiful new blog. I love everything you’re posting and your pictures are so beautiful. Great ideas! Flowers can make such a big difference! Love it! 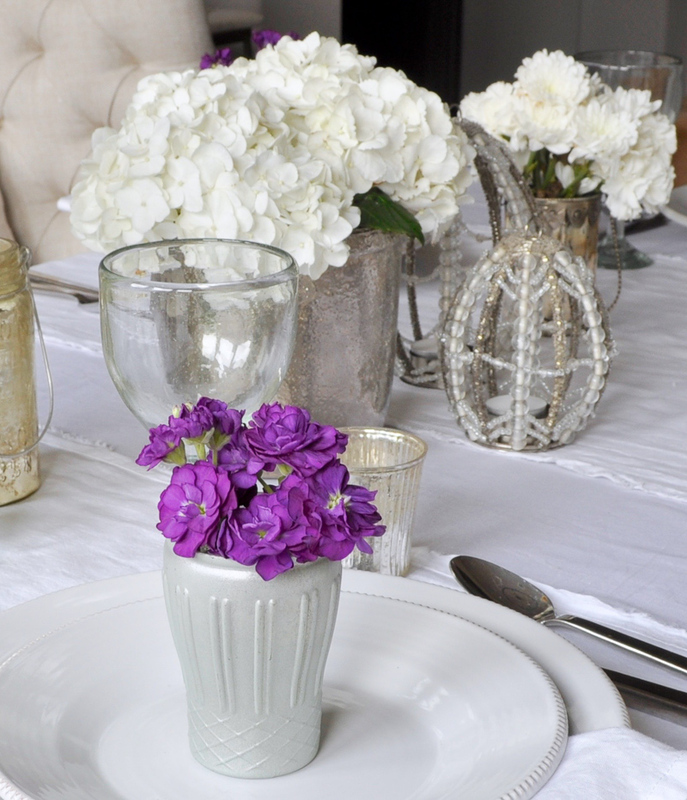 Yes, flowers are the best accent! Thank you!!!!! I tried this with my guests and were very excited. It offers very fresh and stylish air. I love that you tried this! Thank you for sharing!